So finally I got a S1000XR. I am 57 years of age and ride motorcycles since I became legally old enough to get my driver license. I started with a BMW R75/5. I was the only guy with an ugly Boxer instead of a shiny and fast 4 cylinder Japanese bike. But I liked it. Over the years I tried more than one bike, Kawasaki's, Honda's, Yamaha's, Triumph, choppers, racers, tour. I tried them all. Every time I ended up with a BMW. K1200S, K1300S, K1600GT, S1000RR, R1200GS ... and than I tried the S1000XR. Just like the K1600GT the best of two worlds. 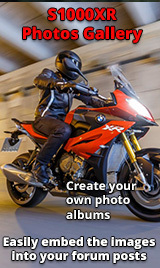 K1600GT is sport and touring, the S1000XR racy and fun. My wife is less picky. She tried a lot of bikes also but ended up with a Yamaha MT-09 Tracer. Almost the same as the S1000XR but a little bit more docile. So that is my bike history. I always kept riding because it brings me so much fun and a peaceful mind. And there he is! Already removed the pannier rack. SO ugly! You come to Holland and hope for dry weather? Holland is just like the UK. It always rains in Holland. And it is COLD. Not yet sure if I wiil be at Assen but wish you a good time.